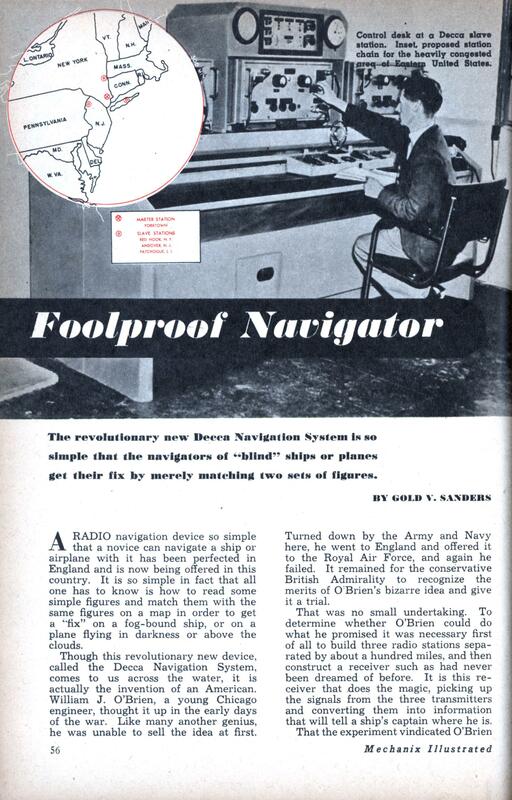 Though this revolutionary new device, called the Decca Navigation System, comes to us across the water, it is actually the invention of an American. William J. O’Brien, a young Chicago engineer, thought it up in the early days of the war. Like many another genius, he was unable to sell the idea at first. Turned down by the Army and Navy here, he went to England and offered it to the Royal Air Force, and again he failed. It remained for the conservative British Admirality to recognize the merits of O Brien’s bizarre idea and give it a trial. That was no small undertaking. To determine whether O’Brien could do what he promised it was necessary first of all to build three radio stations separated by about a hundred miles, and then construct a receiver such as had never been dreamed of before. It is this receiver that does the magic, picking up the signals from the three transmitters and converting them into information that will tell a ship’s captain where he is. That the experiment vindicated O’Brien is now a part of the history of the war. His device proved so useful that it was included in the D-Day plan. When the first mine-sweepers and other vessels of the invasion fleet headed for the Normandy beaches on that fateful morning, they were guided accurately to their allotted destinations by those amazingly simple receivers that laugh at fog and darkness. O’Brien meanwhile had turned over the exploitation of his invention to Decca Co., Ltd. After the war the British Ministry of Transport subjected the system to a rigid series of tests on merchant vessels plying the fog-plagued channels around the British Isles. These trials went on for six months and then the Transport Ministry gave its complete approval. As a result, the English merchant fleet is being equipped with O’Brien’s receivers, and the transmitting equipment, now consisting of four separate stations, is sending out signals 24 hours of the day. A second set of transmitters will be set up in Denmark this year, extending the usefulness of the navigation system to the tricky channels of the Skagerrak and Kattegat. Decca Navigator System, Inc., subsidiary of the Decca Navigator Co., Ltd., of London, has recently been organized and proposes to set up four transmitters in the vicinity of New York City. Application has been made to the Federal Communications Commission for assignment of frequencies to be used by them. The principle of the Decca System, put very simply, is this: Two radio transmitters, some distance apart, synchronized and “locked in phase,” send out continuous signals of the same frequency. The two signals arrive in phase at any point equally distant from the two transmitters. At any point not equally distant the signals arrive out of phase. The receiver is so designed that it analyzes the phase difference and translates it into magnetic force to actuate a needle on a dial. A necessary adjunct to the system is an accurate chart of the area to be navigated. This is covered with hyperbolic lines, the direction and position of each line being determined by mathematical calculation. At any point on any one of these lines the difference in phase of the two signals received will bear the same relationship to each other. The lines are given arbitrary numbers, corresponding to numbers on the dials of the receiving set. It will be seen that by reading the numbers on a dial, the navigator may always know that he is on a certain hyperbolic line. But he does not know at what point he is on this line—not until we bring in that third transmitter. This is synchronized with the other two, and its signal is keyed to another set of lines that cross the first set. So there is another dial on the receiver giving an independent set of numbers. 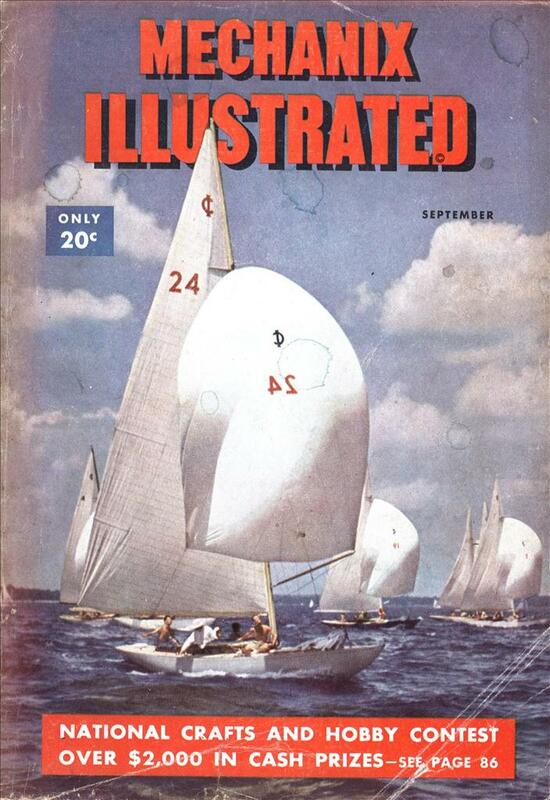 By reading the numbers off both dials and finding the correspondingly numbered lines on the chart, the navigator sees where the two lines cross each other, and that is where he is. For convenience in using the system, the two transmitting stations on either side of the master station are designated as the red and the green slave stations. The two sets of lines on the map are thus drawn in red and green to match the signals that control them. Great accuracy is claimed for the system. The grid formed by the crossing red and green lines is quite fine near the transmitters, but the lines diverge as they extend farther from the transmitters and the accuracy of fix diminishes. Within 50 miles, an accuracy to 30 feet is possible. At 300 miles it is within 100 yards. The original Decca system in England now consists of four transmitters, one master and three slave stations. The third is designated the purple slave, and the lines on the map applicable to it are also in purple. The four stations supply complete coverage for 360 degrees around the system. Only two sets of lines are used at any one time by the mariner or plane pilot in fixing his position. The Decca system is fully as applicable to navigation of planes as ships and has proved its usefulness for both under strict British experimental operations. One of the tests to which it was subjected was that of locating exactly a cathedral in Antwerp, 200 miles distant from the point of a plane’s departure. The blacked-out navigator directed the aircraft to its destination with nothing to guide him but the two dials of the Decca receiver. When his numbers showed him he was over the cathedral he pressed a button that snapped a photograph of the area as a test of accuracy. The finished picture showed the top of the cathedral directly in the middle. It so happens that this navigator was Dudley Toller-Bond, who is now in this country representing the Decca company as its chief engineer. Toller-Bond was Senior Scientific Officer of the Admiralty Department of Scientific Research and Experiment at the time when that body gave young O’Brien his first chance to prove the feasibility of his invention. The British scientist was so impressed with the efficiency of the method that he himself became affiliated with the Decca Navigator company when the war ended. The company is prepared to erect the transmitting equipment for the New York area and operate it if granted the low-frequency bands it has requested. Its revenue would come from renting the receiving sets to steamship and air transport companies and to private operators of boats and planes. The receivers will not be sold. When the system is in operation in this territory it will give radio coverage for a distance of 600 miles in daytime and about half that at night. The pilot of a boat or plane will then be able to use it by renting and carrying with him a receiving set weighing about thirty pounds, together with suitable maps with their elaborate network of red, green and purple lines. The dials on the receiver must be set at the numbers corresponding to the location of the ship or plane at the start. This is done easily by referring to the map. Thus given the proper starting point, the receiver takes care of itself. The numbers on the dials change when the receiver is carried across the hyperbolic lines. These lines actually provide the pilot with a vast number of “radio beams.” If it suits his convenience to take a course directly on any line, rather than cross over, the dial keyed to that line will remain at the same figure constantly. Meanwhile, the dial keyed to the crossing lines will change numbers every time a line is crossed. Since the lines become almost straight at a distance from the transmitting equipment, it is entirely feasible to follow right along one of them for great distances. The pilot of a private plane could hardly ask for a simpler, safer way of keeping his craft on course. Yet, if he leaves such a line entirely, his dial will tell him just how far he has departed from it in either direction. Going still further in its efforts to serve air transport, the Decca Co. has devised an automatic tracking receiver designed to give a transport pilot continuous direction from one airport to another. This is accomplished by a method of recording the course of an entire trip on a strip of film. This film passes through the receiving apparatus as the trip progresses. It actuates a single needle on a dial and by watching this needle the pilot can tell at once if he tends to get off course. The same strip of film also gives the pilot other vital information continuously. It shows him on an indicator at all times how far he is from his destination, in miles, how he is adhering to schedule, in minutes ahead or behind, and his actual ground speed. The Decca system is not a blind landing device however. Its operation is independent of altitude. It is designed to bring a transport pilot to the fringe of the landing area, but from there on he will have to go over to other control methods for blind landings. But the tracking equipment can be made to give the pilot a series of orbits around a landing area which he can follow easily by watching the one needle. In this way the system offers relief from the problem of stacking planes when landing conditions are bad. On instruction from the control tower the pilot can select one of several orbits by switching a button on his receiver. A large number of planes could thus be permitted to circle indefinitely without stacking up at different altitudes. This should help to save much of the time now lost in the usual stacking system. The first installation of the Decca System in this country calls for transmitters to be built at Patchogue, Long Island, Andover, N. J., Red Hook, N.Y., and Yorktown, N.Y. the last being the master station. Sites have been obtained, according to Mr. Toller-Bond, and the installations could be complete within six months of receiving authorization from the FCC. This series of transmitters could serve the most congested waterways and airways of the United States. Its coverage would extend down into South Carolina, as far west as Detroit, far up into Canada and 600 miles into the Atlantic ocean. This is the daytime range; at night the range is about half as great, due to the presence of sky wave which interferes with the system. Dental Plate For Pipe Smokers Inventors are always seeking new ways to make life easier and more enjoyable. Christian Hansen of Brooklyn, N. Y., thought that persons with dental plates or loose teeth might have difficulty tightly gripping the mouthpiece of a pipe. So he designed a pipe rest that is partially able to support the pipe by the use of the chin. The chin rest is also useful to support the pipe in an upright position on a table or desk. For good measure, the inventor also includes in his device a blade useful for scraping tobacco from the bowl of the pipe. Greg Goebel’s website (quite a treasure trove of information, particularly on aircraft) has some nice information on Decca and other related hyperbolic navigation systems. The first to be operational, at least to any great extent, was apparently the British Gee system, which was more aimed at air navigation than shipboard service; it had greater accuracy but lesser range. Nowadays, GPS operates on the same general principles, though of course the details of the radio signals are quite different. Summarizing what wikipedia has to say about the history of this system, there were DECCA installations built out all over the planet through 1967, and was shut down in the 2000-2001 timeframe. Apparently a test install in London (testing it with cabs and busses) found it accurate enough to determine which lane the vehicle was in (since accuracy is better the close to the sites the vehicle is, and they were quite close to the transmitters.) All DECCA equipment was leased from Decca Navigator Co. Ltd. up until the early 1980s, when their monopoly on DECCA-compatible equipment was broken. This caused the income for operating DECCA to drop off, and by the 1990s the system in the UK was operated by the Lighthouse Authroity of the Ministry of Transportation. In the US, DECCA was not used. There was a prototype system built out in New York City for use by New York Airway’s helicopters (The line-of-site requirement, and position errors near the VOR site, made VOR unsuitable for this use.) Apparently the receiver on this system, instead of having some dials, actually had a moving map so the pilot could just glance down and see where he was! Political interests were quite concerned ships in NY harbor would being using DECCA and then DECCA use would spread nationwide, as this would gut sales of (US-built) VOR receivers. So, DECCA was banned for ship navigational purposes in the US.